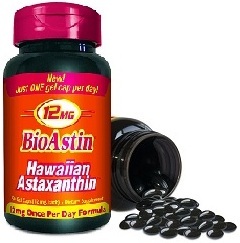 Item #0692: BioAstin Hawaiian Astaxanthin is derived from microalgae called Haematococcus Pluvialis. It is grown on land in controlled, fresh water ponds and contains no fish or shellfish bi-products. Astaxanthin is a carotenoid. Carotenoids are pigment colors in nature. Astaxanthin is the red pigment color found in salmon, shrimp, crab and even the pink color in flamingos. BioAstin works throughout the entire body - our eyes, brain, cardiovascular system, muscles, and skin - everywhere. It supports a healthy oxidative balance which leads to improvments in many health conditions. 550 times stronger than Vitamin E and 11 times stronger than beta carotene. BioAstin Hawaiian Astaxanthin products contain all natural functional nutrients that are clinically proven to enhance human health. Guaranteed stable Astaxanthin content over time. Natural Astaxanthin has no known side effects or contraindications. This new product has the highest potency levels of Astaxanthin per gel cap available on the market today. Astaxanthin is known as nature's most powerful antioxidant; backed by over 200 scientific studies. This new formula is ideal for athletes or individuals with certain health conditions.